15th Sept is celebrated as Engineer’s Day in India – commemorating Sir M Vishweshvaraya, KCIE, FASc. It is perhaps fitting that the day remembers an Engineer so popular and devoted to the life of engineering. Google celebrated the day by dedicating a doodle to celebrate M Visvesvaraya's 158th birthday who is known to have lived by the phrase, "Work is Worship". The doodle had a color sketch of Sir MV with a sketch of a bridge in the background. The bridge, among M Visvesvaraya's most notable projects, is a representation of the Krishna Raja Sagara Lake and dam. In 1924, Sir MV designed the Krishna Raja Sagara Lake and dam, the largest reservoir in India at the time, and oversaw the construction of the project. The dam is known to have provided drinking water for several cities. Sir Mokshagundam Vishweshvaraya KCIE, FASc (1861 – 1962) the brilliant engineer was also the 19th Diwan of Mysore, who served from 1912 to 1918. He received India's highest honour, the Bharat Ratna, in 1955. He was knighted as a Knight Commander of the British Indian Empire (KCIE) by King George V for his contributions to the public good. Visvesvaraya took a job with the PWD of Bombay and later was invited to join the Indian Irrigation Commission. He implemented an extremely intricate system of irrigation in Deccan. He designed and patented a system of automatic weir water floodgates that were first installed in 1903 at Khadakvasla Reservoir near Pune. These gates were employed to raise flood supply level of storage in reservoir to the highest level likely to be attained without causing any damage to the dam. In 1906–07, Government of India sent him to Aden to study water supply and drainage systems. Visvesvaraya achieved celebrity status when he designed a flood protection system for city of Hyderabad. He was instrumental in developing a system to protect Visakhapatnam port from sea erosion. Visvesvaraya gave his valuable technical advice for the location of Mokama Bridge over Ganga in Bihar. At the time, he was over 90 years old. He was called "Father of Modern Mysore State". During his service with the government of Mysore State, he was responsible for founding of (under the patronage of the Mysore government) Mysore Soap Factory, Parasitoid Laboratory, Mysore Iron & Steel Works (now known as Visvesvaraya Iron and Steel Limited) in Bhadravathi, Sri Jayachamarajendra Polytechnic, Bangalore, Bangalore Agricultural University, State Bank of Mysore, Century Club, Mysore Chamber of Commerce (presently known as the Federation of Karnataka Chambers of Commerce & Industry (FKCCI) the apex Chamber of Commerce in Karnataka, University Visvesvaraya College of Engineering Bangalore and numerous other industrial ventures. He encouraged private investment in the industry during his tenure as Diwan of Mysore. He was instrumental in charting out the plan for road construction between Tirumala and Tirupati. He was known for sincerity, time management, and dedication to a cause. Visvesvaraya is known to have designed and planned the entire area of Jayanagar in south Bangalore. He joined service as assistant engineer in Bombay, 1885; served in Nasik, Khandesh and Pune; was Sanitary engineer, Bombay, member, Sanitary Board, 1901; gave evidence before Indian Irrigation Commission, 1901. He retired from British service, 1909; later became Chief engineer and secretary to the government of Mysore, 1909. It is stated that he retired on his volition and went on touring foreign countries studying them and then suggested relief measures to save Hyderabad from the threat of Musi river. With the support of Krishnaraja Wodeyar IV, Maharaja of Mysore, Visvesvaraya made good contribution as diwan to the all-round development of Mysore state. Not only the achievements listed above, but many other industries and public works owe their inception or active nurturing to him. Many educational institutions have been named after him and two metro stations in India, one in Bengaluru on the Purple Line (Sir M. Visvesvaraya Station, Central College), and another one in Delhi on the Pink Line (Sir Vishveshwaraiah Moti Bagh), have been named after him. In case you care to ask FASc after his name - Indian Academy of Sciences, Bangalore was founded by C. V. Raman, and was registered as a Society on 24 April 1934. Inaugurated in y 1934, it began with 65 founding fellows. The first general meeting of Fellows, held on the same day, elected Raman as President, and adopted the constitution of the Academy ~ Sir Visvesvaraya was one of its renowned members. Krishna Raja Sagara, also popularly known as KRS, across Cauvery is attributed to this great person. The ornamental garden, Brindavan Gardens, is visited by thousands of people daily. The region of Mysore and especially Mandya had historically been dry and had witnessed mass migration to adjoining areas in the hot summers. A severe drought in 1875–76 had wiped out one-fifth of the population of the Kingdom of Mysore. Crop failures were common due to lack of water for irrigation. The Kaveri river was seen as a potential source of irrigation water for the farmers in and around Mysore in the erstwhile Kingdom of Mysore.The Chief Engineer of Mysore M. Visvesvaraya presented a blueprint of a dam to be built across the river near the village of Kannambadi. However, he faced opposition from the finance ministry of the government of Mysore, who said the project would "serve no purpose" and that the electricity produced from it would not be of complete use due to lack in demand. He then approached T. Ananda Rao, the Diwan of Mysore and the Maharaja Krishna Raja Wadiyar IV for a reconsideration. Upon examining, the latter gave his consent issuing an order on 11 October 1911 to begin the project and a sum of ₹81 lakh was set aside for it. Madras Presidency then opposed the project and urged the imperial government to not approve it. Upon Visvesvaraya's persuasion, the government consented. 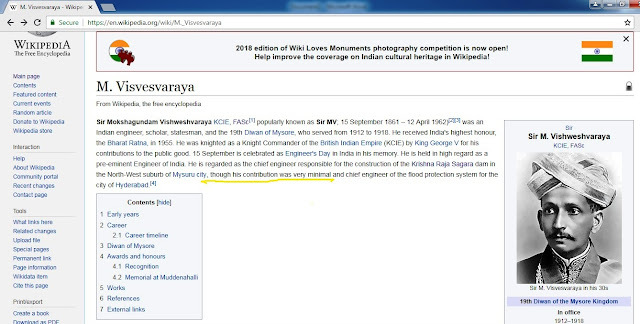 Incidentally, if you are to glance the Wikipedia page on Sir Visvesvaraya again – the first para reads : “He is held in high regard as a pre-eminent Engineer of India. He is regarded as the chief engineer responsible for the construction of the Krishna Raja Sagara dam in the North-West suburb of Mysuru city, though his contribution was very minimal and chief engineer of the flood protection system for the city of Hyderabad.” .. .. .. is something amiss on this page !! !